It was late 2016 when I visited the desert for the first time. Death Valley was an immense landscape that changed my perspective on what it means to travel and stay in the desert. I had always thought it to be a dry, barren landscape with blowing sand and dust everywhere and not much more. While some of those attributes can be correct, I also learned that there is so much more to see and experience than my preconceived notions. Since then, I have been back to Death Valley once more, and the High Desert of the Eastern Sierras several times after that. When a friend of mine asked me if I wanted to travel to Black Rock Desert in Northern Nevada for a weekend, I jumped at the opportunity. My explorations so far have shown me many areas of California and Oregon, but Nevada would be new territory. And only being a 6 hour drive makes this destination within reach for the Weekend Warrior. I was ready, and overdue for a trip. I took a Friday off so Andy and I could leave in the morning from the SF Bay Area. When you spend 6-8 hours just traveling to the destination, you need to make it worthwhile. The drive was simple. Podcasts and easy music helps tick the time away behind the wheel. We made a pitstop in Tahoe National Forest on our way through to Nevada. Fresh snowfall made it a fun stop for the dogs to get out and stretch before loading up for the remainder of the drive. It was so nice to see snow in the Sierras again considering the last time I drive through the I-80 corridor in the beginning of January, there was no snow to be found. Back on the road, we made it to Sparks to meet up with the other member of the weekend group, Cy. I took a quick detour into Scheel’s to find some warmer socks and additional heating pads for the forecasted cold night ahead. We left Sparks and drove East on I-80 for another 30 minutes before heading North and towards the desert. It was late afternoon as we drove along a windy two lane road through Indian Reservations, past Pyramid Lake, finally arriving in Gerlach, NV to top off our tanks before hitting the Playa floor. “Make sure you’re in 4HI when you’re out there. You’ll want to be able to steer when it gets soft or the playa will steer for you. Oh, and if you start to bog down… whatever you do don’t let up…” That’s what I heard Andy say on the radio as we turned off the pavement and onto the playa basin. I shifted to 4HI as we accelerated onto the floor and across to the other side. The light was failing as we turned on out additional lighting to make bumps and dip easier to spot. We were cruising at 70+ miles per hour in a staggered formation. I was white knuckling it with both hands on the wheel pretty much the entire time. I turned the music off so I could listen to the 4Runner and get a feel for how it was performing. This was a totally new experience for me and I was eyes wide open trying not to get stuck or wreck the truck on a wash. It was an adrenaline rush and the 4Runner performed perfectly with the Kings soaking up every bump on the floor. We made it 30 miles across the floor to our camp on the other side perched at the edge of the playa against Black Rock Point. The evening near the hot pond was very relaxing after a 7 hour day of driving. We put on a show for anyone watching with some aerial explosions, sat around the campfire to keep warm and after passing around a jug of campfire whiskey we called it a night. The wind kicked up early in the morning. I woke up to the sound of the plastic clips that normally hold the door flaps up, clanging against the outside of the AutoHome shell. Later in the day I came up with a bush fix to keep them quiet involving plastic fasteners. Despite the wind, the view from the tent was gorgeous. 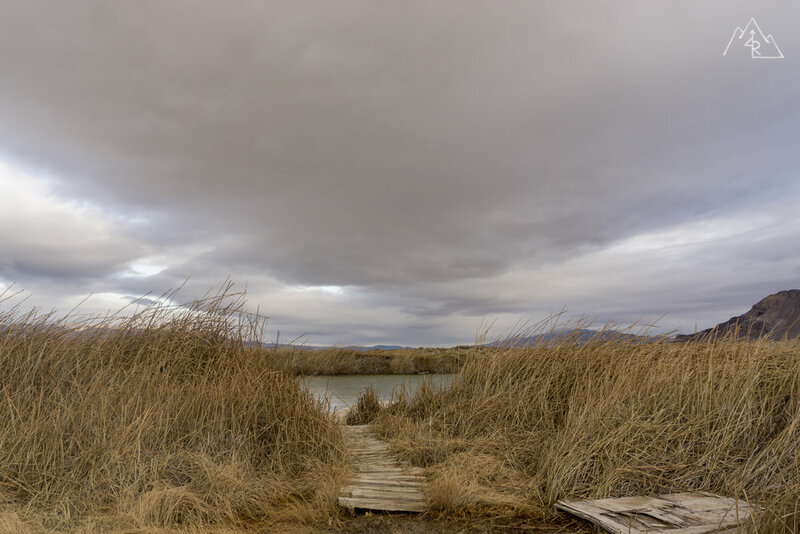 Grey skies created a bright but muted light on the landscape. One of my favorite things about having a roof top tent is the elevated view of the surrounding landscape in the morning. Being 7 feet up gives an entirely different perspective to where you were camping the night before. The night ended up being warmer than forecasted, but that didn’t deflate my desire to take a dip in the hot pond. Cup of coffee in hand, we spent the morning in the pond enjoying the natural warmth of the geothermal pool. Our route North followed a pretty typical high desert road. Cattle guards, sporadic silt deposits, washboards in the corners, and random softball size rocks strewn throughout. This was my first test of the Kings on this terrain, and they performed flawlessly over the 30 plus miles it took us to get to our next camping area. Andy has spent a good amount of time driving these roads, exploring what the area has to show. So, following him was a great way for me to get my first taste of the Black Rock Desert. After looking down a few roads, just for the sake of seeing what was at the end, we made our way into camp for the rest of the afternoon. Perched on a knoll, we had a view of the entire valley surrounding us. Better yet, we were in close proximity to another great soaking spot. With the vehicles parked, we went down for an afternoon soak to enjoy what was left in the day. Hot water flowed into the man made tub from a geothermal creek above. This valley is scattered with hot creeks, some hotter than others. As we sat there, the sky lit up as the sun went down. According to Andy, this is a common sight to see here in the Northern Nevada deserts. 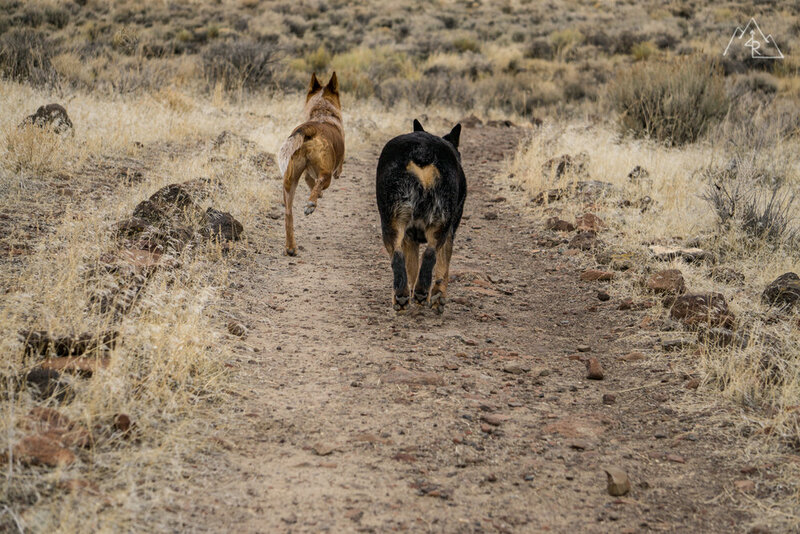 The dogs ran around us chasing whatever we could throw before we dried off and went back to camp. Fire lit, meals cooked, music playing, we enjoyed another great evening in the middle of nowhere. Thankfully the wind had died down from the morning making our evening show better than the first night. Maeve and I woke up in the tent to the sound of coyotes in the valley howling. You couldn’t see them when you looked around, but there were plenty of them out there hunting rabbits and other small game. This majestic moment was interrupted by Andy and Taco doing their best impressions of the coyotes by howling from their tent in perfect sync. We had a ways to drive back home, so we packed up and headed south towards the playa. The playa highway is much faster than taking the road around, so we kicked it into high gear and blasted the desert floor. Windows open, music up and 85 mph was a hell of a way to end the trip. We hit the pavement outside of Gerlach and in an uneventful drive, made our way back to California, land of In-n-Out and crappy drivers! I can see where the addiction lies being in this vast open space. It feels like a place with endless freedom to roam and enjoy. A place that I look forward to visiting again in the future.